The side event to this week’s meeting of the WIPO Standing Committee on Copyright and Related Rights (SCCR) was moderated by Manon Ress, director of Information Society Projects at KEI. The latest version of the text at issue is here: (IPW, WIPO, 28 November 2018). Anubha Sinha of the Centre for Internet & Society in India reflected on the consequences of the treaty on balancing the position of broadcasters and internet streaming entities, fearing most the creation of an unequal playing field. “The point I’m trying to make is that this treaty seems to be set to protect a narrow slice of broadcasters, with significant market power in their home markets,” she said. Teresa Hackett gave the perspective of Electronic Information for Libraries (EIFL), highlighting the fact that preservation concerns born-digital content too. The key point of this topic, in Hackett’s opinion, are four principles for limitations and exceptions in any broadcast treaty: not depriving someone of a lawful right to use content or access to content in a public domain; creating a treaty which is future-proof with a mechanism to allow for new exceptions introduced for content; not allowing licence terms or technological protection measures (TPMs) to take away the exceptions and agree on the fact that exceptions must be mandatory. Luis Villaroel spoke on behalf of Innovarte, suggesting a collaboration, not an opposition, between broadcasters and the interest of the civil society. “Something that would be useful is if broadcasters would support the inclusion in the broadcasting treaty proposal of enough safeguard for the public interest, particularly for libraries, disabilities and other activities that are important for the functioning of the society and, even, the economy,” he said. Teresa Nobre of Communia presented the views of Creative Commons creators and users, evidencing the fact that broadcasters, following the treaty as it is proposed at the present time, get an additional right above and beyond the ones granted to the copyright holder. The closure was entrusted to James Love, from KEI, who said the real issue is not signal privacy, but something different. “If the broadcasters just wanted a treaty to address the signal piracy, they could have had it before, these are solvable problems. But the fight is really over post-fixation rights,” he said. Love also raised concern that civil society may not be being consulted sufficiently on the negotiations. 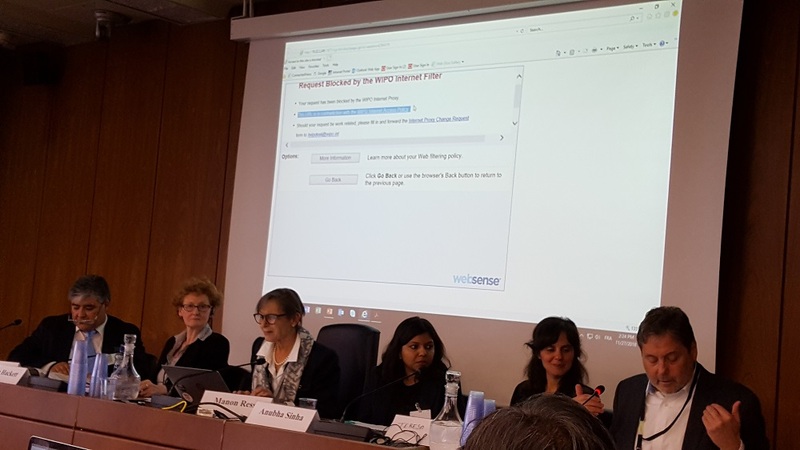 "WIPO Draft Broadcasting Treaty: NGO Views On What To Keep, What To Change" by Intellectual Property Watch is licensed under a Creative Commons Attribution-NonCommercial-ShareAlike 4.0 International License.